After three weeks of NFL action, only five teams remain undefeated. The Patriots are one of them. So are the Broncos, Vikings, Eagles, and...the Ravens? Its schedule has been light, but Baltimore is 3-0 and looking to continue a surprising run of success. But are they for real, or are the Ravens just pretenders? To start, it's not like they've played the Patriots for three weeks. In Week 1, they barely squeaked by the Bills, 13-7. They let the Browns jump out to a 20-point lead in Week 2 before coming back to win 25-20 (Browns will be Browns). In Week 3, they needed a final-minute field goal to edge the lowly Jaguars. Their opponents are 1-8 this year, so it wouldn't be a stretch to call Baltimore more lucky than good. But, there is a reason they're 3-0 and not 0-3. Last year Baltimore struggled to close out games, and its mediocre defense was often the team's downfall. This year, however, the Ravens have found a way to win close games, and the defensive side of the ball is at its heart. Because the offense hasn't improved much, the defense has had to keep Baltimore in games and give the O a chance to pull through. So far, they've delivered. Only three games into the year, they've already racked up 9 sacks, 5 interceptions, 2 forced fumbles, and 2 blocks. If they can keep this up, the Ravens can compete, but that's unlikely. If it's been this difficult for Baltimore to get by the Bills, Browns, and Jags, who have some of the worst offenses in the league, how will they fare against division rivals Pittsburgh and Cincinnati? To make matters worse, they also face the Cowboys, Eagles, and Giants--all high-powered offenses. Anything is possible in the NFL, but don't expect the defense to hold up against repeated tests like those. And unfortunately for the Ravens, if they can't keep the team in games, the offense won't be able to carry it. At the end of the day, the Ravens have improved, but are still far away from being considered contenders. 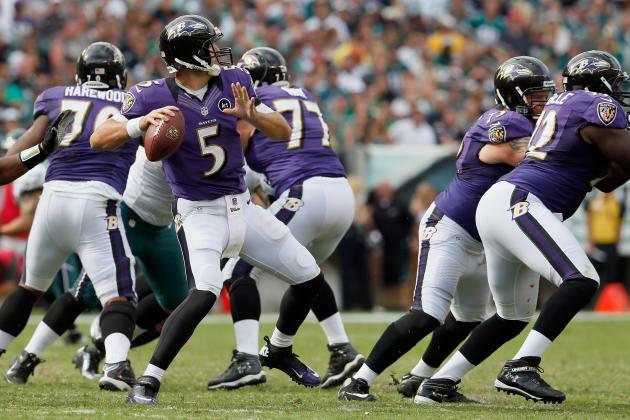 Without an improvement on offense, the defense is bound to buckle, and when it does, the Ravens will collapse. So, contenders or pretenders? Definitely the latter--don't expect them to pose a threat to the Patriots when they meet in December.